After deadly protests forced the closure of a plant, Chairman Anil Agarwal is blaming a foreign conspiracy. That is no way to reassure rattled investors in the Indian miner, especially given Vedanta’s controversial history. At least a new incoming CEO can set a better tone. 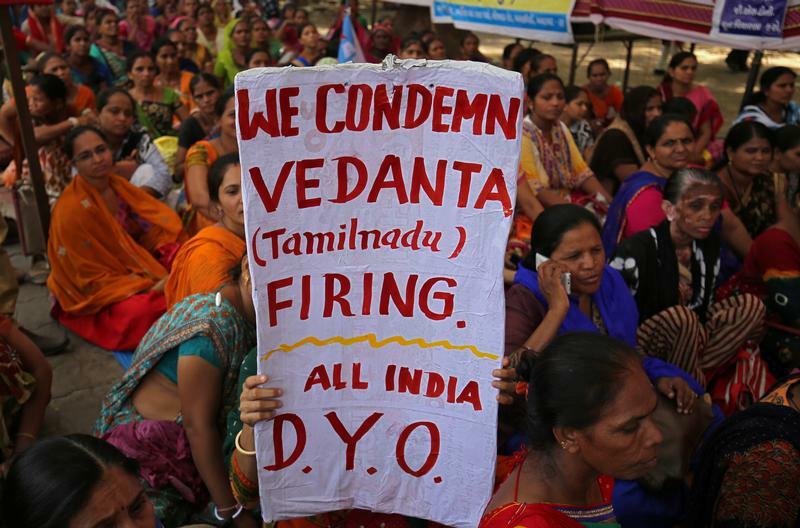 London-listed Vedanta Resources is working on a legal challenge to the closure of its copper smelter by the southern Indian state of Tamil Nadu, Reuters reported on May 29, citing two sources. The sources added it would not proceed until tensions over deadly protests earlier in May had eased. P. Ramnath, chief executive of Vedanta’s India copper business, told Reuters on May 25 that it hopes to restart the Sterlite Copper smelter and still wanted to double capacity, despite claims from residents and environmental activists that it pollutes local air and water. Police opened fire on May 22 as thousands of protesters marched towards a government office, demanding the plant’s closure. Ten people were killed that day, and three more have since died. In an interview with the Economic Times published on May 28, Chairman Anil Agarwal blamed “fake activism” for “raking up the sentiments of the public for their vested interests” but said he was saddened by the deaths. Agarwal said Sterlite Copper had “world class environmental practices”. Agarwal has previously said on Twitter that his company was the victim of a foreign conspiracy to keep India reliant on imports. The smelter accounted for 5.4 percent of Vedanta Ltd’s consolidated EBITDA during the last financial year. The Indian-listed subsidiary is 50.1 percent owned by Vedanta Resources, according to the company’s latest investor presentation. Shares in the latter stood at 709 pence in early morning trading in London on May 30, down about 16 percent from the close on May 22.